Week 7 came and went. Not much happened other than #FogGate. None of the games were particularly good, and a lot of the fantasy scoring was done on Thursday or Monday. Well, let's get into the waiver wire. All of these players are owned in under 40% of Yahoo! leagues. Previously listed players will not appear unless they are for streaming purposes. Dion Lewis (30% owned) - For the second straight week, Dion Lewis was in full control of New England's backfield. He dominated touches Sunday, rushing for over 75 yards. People forget how good Lewis is. When he was the featured back in 2015, Lewis consistently put up some of the best numbers in the league. He's the best blend of pass catching and running that New England has on the team and you know Belichick has to love that. Lewis gets one of the weaker run defenses in the Los Angeles Chargers this Sunday. Tyler Kroft (17% owned) - One tight end named Tyler went down, so another tight end named Tyler took his place. The funniest part is that they're playing up to one another's level. In Tyler Eifert's absence, Tyler Kroft has caught 14 passes for 129 yards and 3 touchdowns. He gets the Colts, the Jaguars, and the Titans these next three weeks. None of them are above average defenses against the tight end, putting Kroft in a good spot to be your Engram/Gronk/Kelce/Ertz bye week replacement. 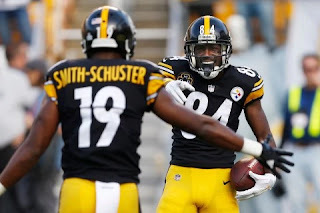 JuJu Smith-Schuster (15% owned) - #TeamFindJuJusBike. If you haven't heard, Steelers rookie JuJu Smith-Schuster had his bike stolen earlier today, which meant he had to walk to practice. Maybe Martavis Bryant took it? Just kidding. But, JuJu has established a nice base as WR2 for the Steelers, averaging nearly 10 PPR points per game over his last 6 contests. If Martavis were to leave, JuJu's targets would only go up. Plus, he's got some awesome touchdown celebrations, so having him on my fantasy team gives me another reason to root for the kid. Josh Doctson (14% owned) - Maybe Josh Doctson and Terrelle Pryor had some sort of Freaky Friday incident, because Doctson is the one dominating the snaps and seeing all of the targets. He played 54 snaps last night compared to the 30 that Terrelle Pryor played. We all saw his talent at TCU, and Washington throws the ball a ton. He's still not getting a ton of targets, but if he does, watch out. He's a monster. Cincinnati Bengals (26% owned) - The Colts are either an offense to be feared, or a terrible offense. It's pretty predictable, as they haven't swayed off the terrible-in-negative matchups and good-in-positive matchups narrative. They've got Cincy this week who appear to be a pretty average bunch. I'll take my chances that they terrorize the Colts and use them in the majority of my leagues this week. Also, make sure to take note of Greg Olsen, Corey Davis, and Danny Woodhead. These are all extremely talented guys who are injured at the moment. Olsen is targeting a Week 12 return, Davis in Week 9, and Woodhead in Week 11. If you have a bench spot and don't know what to do with it, it'd be smart to stash one of these guys. All three have league-winning potential.